A recent study led by Dr. Sergios Gatidis of the University of Tübingen revealed an easier – and potentially safer – method of identifying malignancies in pediatric cancer patients. Gatidis and his colleagues pursued this research to improve the quality of care for younger patients. Similar studies have been performed for juvenile and adult oncology patients, but the specific challenges of younger patients set this study apart. 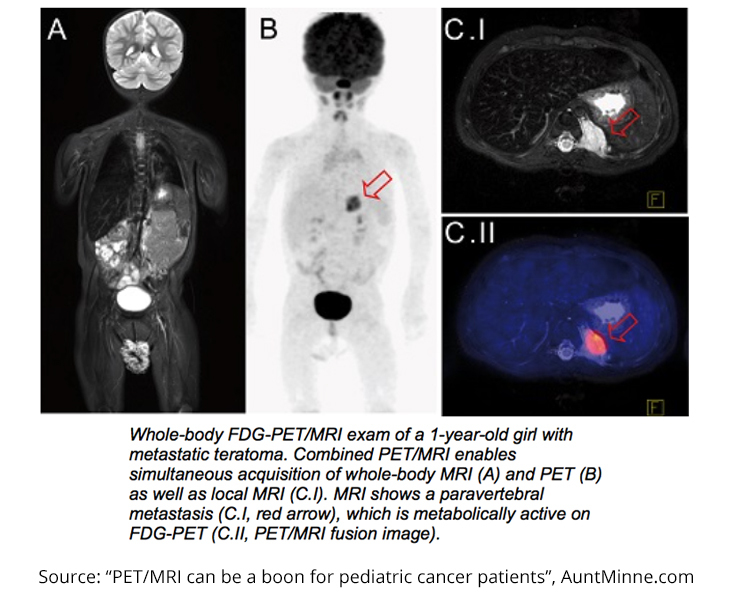 Not only do tumors act differently depending on the age of the patient, but also most children have a difficult time sitting still for extended periods of time, rendering some FDG-PET/CT scans unreadable. The problem then becomes needing to sedate patients, exposing them to more radiation and more medication than what is actually required. This study included nine patients – six boys and three girls – between the ages 1 and 6. All the patients were scheduled to have FDG-PET/CT scans for diagnostic purposes before participating in the study. Two different teams of readers analyzed the images, and the FDG-PET/MRI scans gave more certain diagnostic results than the PET/CT scans. Overall, six of the seven scans that were read differently by PET/CT and PET/MRI had a “clearer morphologic correlate in MRI compared to CT.” Furthermore, 5 of 10 MRI scans led to changes in patient management. The results of the study show that the MRI scans were just as good as CT scans, if not better. By changing the imaging process from PET/CT to PET/MRI, pediatric patients will hopefully be able to experience less total examination time, less exposure to harmful radiation and sedatives, and more accurate treatment planning.